From Goodreads.com: Can a marriage made for money blossom into something more? Sarah Sutliffe, Lady Fairfax, dreams of love—until she overhears her new husband proclaim his heart will never be hers. Devastated, she offers no defense when a sapphire necklace disappears during a ball and she is accused of its theft. Instead, she runs away from the scandal…and the heartbreak. St. John, Viscount Fairfax, has sworn never to love again. How could a mousy merchant’s daughter tempt him to break that vow? Three years after Sarah vanished, St. John uncovers her hiding place. 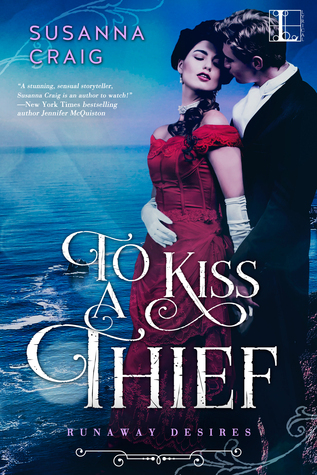 Now, he’s out to prove she’s a thief before she steals his heart. It was hard to believe when reading this that it was a debut novel! I thoroughly enjoyed everything about this novel! It was set up nicely in the beginning (with the jewels going missing and the scandal in which that was discovered), and only continued to improve from there. It was obvious pretty much from the start that this author has a gift in story-telling. She was able to weave together the different events and locations in such a way that the reader actually felt that they were there. I could almost smell the salt water as they stood on the quay. As for the characters? It was evident during the entirety of this story, that there was character growth (even when it wasn't completely evident) - and I enjoyed watching these estranged lovers (for lack of a better word) find each other all over again. Even the "minor" characters (aka the ones who weren't in every scene) were well thought out and added something to the overall plot of the story. I especially liked the outright gossip that came about - everyone knows gossip was an important part of life back then (and even now), but these characters did nothing without a reason. And even that caught my interest - trying to figure out just why. Overall - I would recommend this story to anyone who enjoys a good historical novel . I would definitely read more by this author!